This year we had a barbecue on Christmas Day and had to keep pinching ourselves! We spent a wonderful sunny, warm day outside in the gardens of a friend's Finca, north of Bogota. 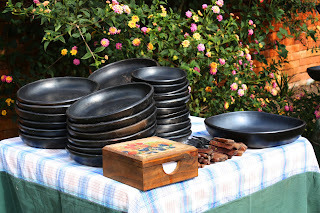 These dishes are made from a traditional Colombian pottery and are known as 'La Chamba'.